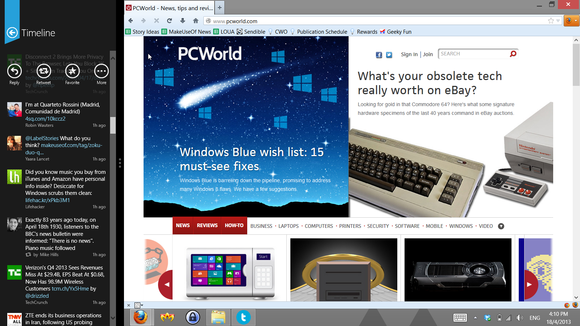 Windows Store versus the world: How do Microsoft's offerings really stack up? The fairly recent Windows 8 operating system, and the even more recent trend of affordable Windows-operated touchscreen laptops and tablets, call for a new look at the way we're used to doing things. One of the most common actions in my daily routine is to fire up MetroTwit and find out what's new in the world according to Twitter. Even Windows 8 can't change that. Tweetro+ is a $10 Twitter client for Windows 8 devices that brings the Modern interface to Twitter in full blast, while retaining all the important features. 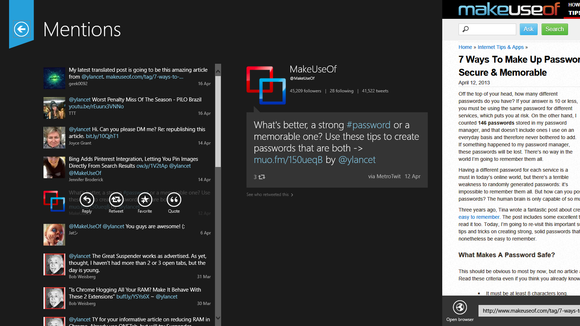 Your Tweetro+ home screen includes customizable columns, the compose window, and an easy account switcher. The Tweetro+ experience starts with a bird's-eye view of your Twitter activity. After connecting your Twitter accounts—Tweetro+ supports multiple users—you can view a visual summary of what's happening on your Timeline, Mentions column, Profile, and any other columns you choose to have. Zooming in, either by clicking or pinching, brings you to your main Twitter screen, where you can switch between users, compose tweets, and view your customizable columns. By default, Tweetro+ comes with a "Lazyworm Apps" column, which includes updates about Tweetro+ and the company's other apps, but removing it is as easy as clicking the "remove column" button. Similarly, you can add other columns by clicking the plus icon or by pinning one of the available columns to your home screen. Tweetro+ works brilliantly with keyboard and mouse, but a touchscreen interface is where it truly shines. The app is optimized to work in both landscape and portrait modes, and while landscape mode does have a small quirk with option buttons hiding the tweet you're currently on, both modes are easy to use and navigate through. The app's home screen shows a glimpse of each column, with the full list of tweets is available when clicking or tapping that column. By clicking or tapping an individual tweet, you'll find the usual Reply, Retweet, and Favorite options, with other options depending on your screen orientation. In landscape mode, Tweetro+ shows links in a convenient in-app browser. The links open automatically on the right side of the screen, and you can bring that window into focus by clicking or tapping it. In portrait mode, the in-app browser disappears, to be replaced by an "Open link" option. Same goes for tweet details such as conversation view, which are available inherently in landscape mode, and via a button in portrait. For your own tweets, a delete option is also available. The in-app browser makes landscape reading easy and fun. 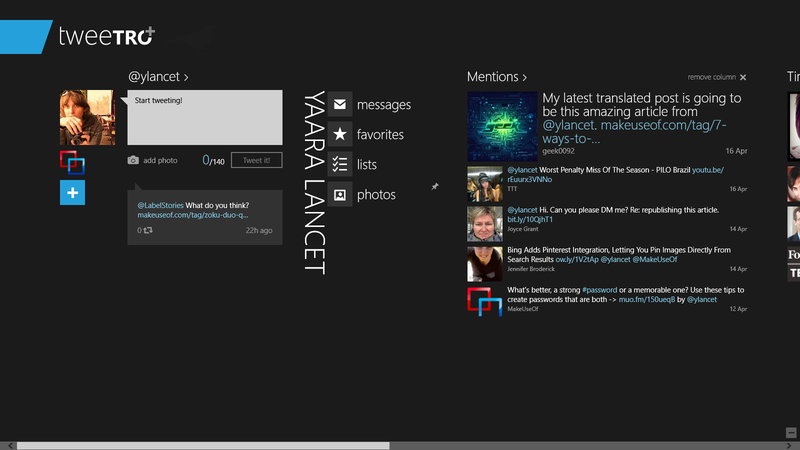 You compose tweets through the home screen, or on a dedicated screen when hitting Reply or Quote. The composer comes with a built-in English spellchecker, a character counter, and an insert image option. Surprisingly enough, Tweetro's composer doesn't automatically shorten links, and I could not find any way to do this within the app. It does, however, cut links short with an ellipsis, so you don't end up wasting your entire tweet on a URL. It just doesn't look as appealing as a shortened link. Under the compose window, you'll always find the last tweet you sent out. Click or tap it to access a list of all your tweets for that account. As slick and useful as Tweetro+ is, it's still a Modern app, and therefore should suffer from the same unfortunate fate most of these apps suffer from: the excruciating lack of multitasking abilities. Luckily, Tweetro+ works amazingly well in snapped mode, letting you use your desktop as usual, with a convenient Tweetro+ column sitting on the left side of your screen. Snapped mode has its own optimized interface, and can be set to open links automatically as you go along. The only curious omission in snapped mode is the ability to add images to tweets. I couldn't find many things wrong with Tweetro+. The app's most prominent shortcoming is its lack of customization options. Push notifications are available, but there's no way to control them or cancel them. You can't set tweets to show exact time, and have to make do with relative times, which I find inconvenient. There's also no real list support: You can easily view and read your lists, but there's no way to create new ones or add users to lists. In snapped mode, Tweetro+ overrides Modern's lack of multitasking capabilities. In general, I would like to have a little more control over the app's appearance and operation, but since Tweetro+ is so well designed, this becomes a moot point in most cases. 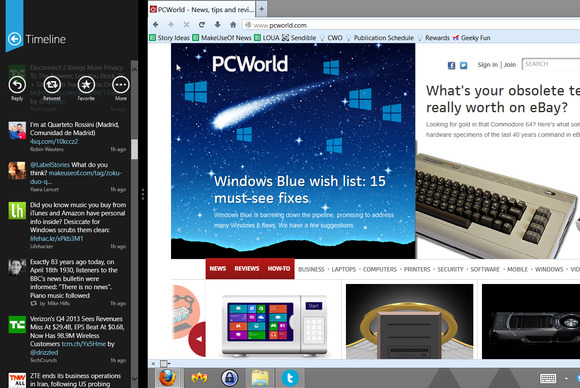 While Tweetro+ might not be the best option around when competing with desktop apps (although it does give them a run for their money), it's an excellent addition to any Window 8 tablet, and plays extremely well with a touch screen. Due to Twitter's API constraints, a free version of Tweetro+ is no longer available, but that $10 is money well spent. If you're looking for a Modern UI Twitter client and the official Twitter app just isn't enough, Tweetro+ is highly recommended.